The Check Point Compliance Blade is a dynamic solution that continuously monitors the Check Point security infrastructure. This unique product examines your Security Gateways, Blades, policies and configuration settings in real time. It compares them with an extensive database of regulatory standards and security best practices. The Check Point Compliance Blade includes many graphical displays and reports that show compliance with the applicable regulatory standards. The Check Point Compliance Blade has a library of Check Point-defined tests to use as a baseline for good gateway and policy configuration. A Best Practice test is related to specified regulations in different regulatory standards. It describes compliance status and recommends corrective steps. Global Tests - Examine all applicable configuration settings in the organization. 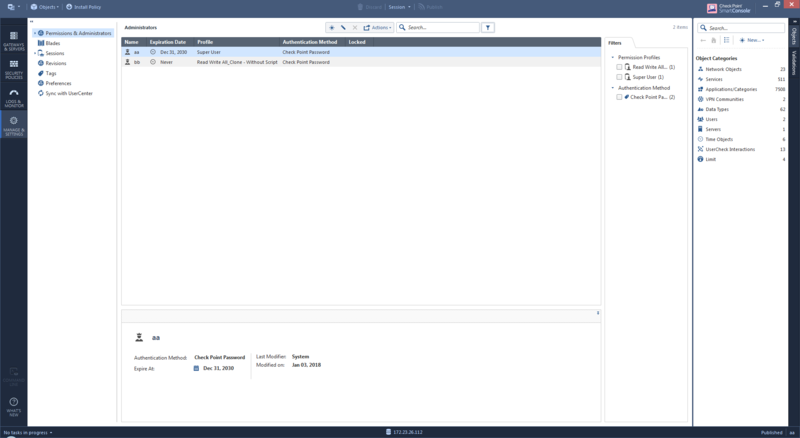 Object-based Tests - Examine the configuration settings for specified objects (gateways, profiles and other objects). The Check Point Compliance Blade monitors the status of applicable regulations and shows them in an easy-to-read view. 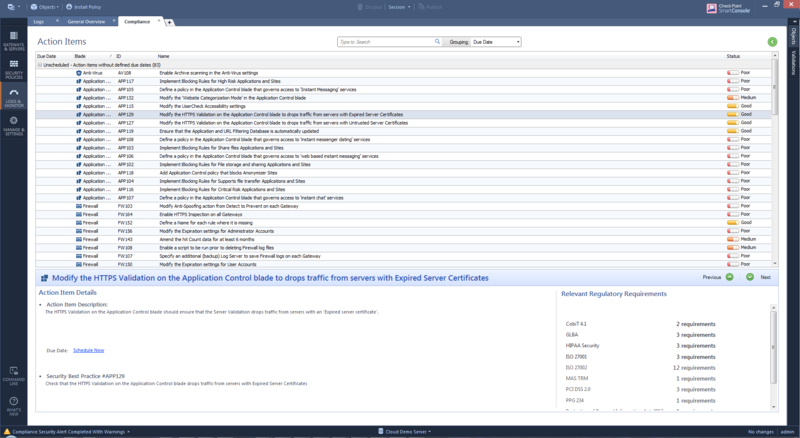 Each line shows the status, compliance score, and best practices for one or more related tests and for related gateways and policies. The Australian Privacy Principles (APPs), which are contained in schedule 1 of the Privacy Act 1988 (Privacy Act). Outline how most Australian and Norfolk Island Government agencies, all private sector and not-for-profit organizations with an annual turnover of more than $3 million, all private health service providers and some small businesses (collectively called 'APP entities') must handle, use and manage personal information. CIPA USA The Children's Internet Protection Act (CIPA) requires that K-12 schools and libraries in the United States use Internet filters and implement other measures to protect children from harmful online content as a condition for federal funding. It was signed into law on December 21, 2000, and was found to be constitutional by the United States Supreme Court on June 23, 2003. CJIS USA A joint program of the FBI, State Identification Bureaus, and CJIS Systems Agency, the Criminal Justice Information Services (CJIS) Security Policy outlines the security precautions that must be taken to protect sensitive information like fingerprints and criminal backgrounds gathered by local, state, and federal criminal justice and law enforcement agencies. CobiT 4.1 USA COBIT (Control Objectives for Information and Related Technologies) is a good-practice framework and supporting tool set created by international professional association ISACA for information technology (IT) management and IT governance. COBIT allows managers to bridge the gap between control requirements, technical issues and business risks. DSD Australia First published in February 2010, and revised for 2014, the Australian Signals Directorate (ASD), also known as the Defense Signals Directorate (DSD), has developed prioritized mitigation strategies to help technical cyber security professionals in all organizations mitigate cyber security incidents. This guidance addresses targeted cyber intrusions, ransomware and external adversaries with destructive intent, malicious insiders, 'business email compromise' and industrial control systems. This guidance is informed by ASD's experience responding to cyber security incidents and performing vulnerability assessments and penetration testing Australian government organizations. FIPS 200 USA Federal Information Processing Standard (FIPS) Publication 200. It is the second of the mandatory security standards, FIPS 199 being the first one, defined by the Federal Information and Information Systems of the United States Federal Government. FIPS 200 is the Standards for Security Categorization. FIPS 200 standard emphases more security during the development, implementation, and operation of more secure information systems. FIPS 200 defines following 17 security areas covered under confidentiality, integrity, and availability (CIA) of federal information systems and the information processed, stored, and transmitted by those systems. Firewall STIG International Firewall Security Technical Implementation Guide (STIG) is a cybersecurity methodology for standardizing Firewalls. GLBA USA Gramm-Leach-Bliley Act. These regulations include financial privacy guidelines and safeguards related to information security. GPG13 UK Of the 35 guides, the Good Practice Guide 13 (GPG13) defines requirements for 12 Protective Monitoring Controls (PMC), which comprise of tasks such as event log management and use of intrusion detection and prevention systems. Local authorities are required to conform to GPG13 in order to prevent accidental or malicious data loss. As connection to GCSX encompasses access to sensitive and confidential data, compliance with GPG13 is imperative for protecting privacy and preventing data breaches. It is imperative that log is collected from systems that provide the security mechanisms. HIPAA Security USA Health Insurance Portability and Accountability Act of 1996. These regulations require government agencies, insurers and health care providers to protect all data that they collect, maintain or use. ISO 27001 International Standards for the implementation of Information Security Management Systems (ISMS). This standard includes 133 control objectives that cover organizational security architecture. ISO 27002 International Supplemental controls and best practices for implementation of Information Security Management Systems (ISMS). This standard includes detailed control objectives that are applicable to certain industries. Katakri 3.0 Finland Katakri 3.0 refers to the Finnish National Security Authority's National Security Auditing Criteria. Katakri is divided into four sub-divisions: Administrative, Personnel, Physical, and Information Assurance. Katakri provides different levels of security requirements. The Check Point Katakri mapping is based on 'Requirements for the base level (IV)'. MAS TRM Singapore Various Technology Risk Management (TRM) guidelines for Monetary Authority of Singapore (MAS). NCIPA USA The Neighborhood Children's Internet Protection Act (NCIPA) sets guidelines for a library's "policy of Internet safety". This policy must address: "(I) access by minors to inappropriate matter on the Internet and World Wide Web; (II) the safety and security of minors when using electronic mail, chat rooms, and other forms of direct electronic communications; (III) unauthorized access, including so-called 'hacking', and other unlawful activities by minors online; (IV) unauthorized disclosure, use, and dissemination of personal identification information regarding minors; and (V) whether the school or library, as the case may be, is employing hardware, software, or other technological means to limit, monitor, or otherwise control or guide Internet access by minors". NCIPA also requires a library to "...provided reasonable public notice and held at least one public hearing or meeting which addressed the proposed Internet use policy." NERC CIP USA The NERC CIP (North American Electric Reliability Corporation critical infrastructure protection) plan is a set of requirements designed to secure the assets required for operating North America's bulk electric system. NERC CIP (v.5) USA The NERC CIP (North American Electric Reliability Corporation critical infrastructure protection) plan is a set of requirements designed to secure the assets required for operating North America's bulk electric system. On November 22, 2013, FERC approved Version 5 of the critical infrastructure protection cybersecurity standards (CIP Version 5), which represent significant progress in mitigating cyber risks to the bulk power system. In 2014, NERC initiated a program to help industry transition directly from the currently enforceable CIP Version 3 standards to CIP Version 5. The goal of the transition program is to improve industrys understanding of the technical security requirements for CIP Version 5, as well as the expectations for compliance and enforcement. NIST 800-41 USA National Institute of Standards and Technology (NIST) guidelines for firewalls and firewall policies. NIST 800-53 USA National Institute of Standards and Technology (NIST) recommend security controls for federal government information systems and organizations. PCI DSS 2.0 USA PCI DSS 2.0 (Payment Card Industry Data Security Standard Version 2.0) is the second version of the Payment Card Industry Data Security Standard (PCI DSS) released in October 2010. PPG 234 Australia Prudential Practice Guide (PPG) aims to assist regulated institutions in the management of security risk in information and information technology (IT). It is designed to provide guidance to senior management, risk management and IT security specialists (management and operational). The PPG targets areas where APRA continues to identify weaknesses as part of its ongoing supervisory activities. The PPG does not seek to provide an all encompassing framework, or to replace or endorse existing industry standards and guidelines. Protection of Personal Information Act, 2013 South Africa Protection of Personal Information (POPI) Act governs the way personal information is collected, stored, used, disseminated and deleted. SOX USA Sarbanes-Oxley (SOX) act is intended to protect shareholders and the general public from accounting errors and fraudulent practices in enterprises, and to improve the accuracy of corporate disclosures. The act sets deadlines for compliance and publishes rules on requirements. Statement of Controls (ISAE 3402) International International Standard on Assurance Engagements (ISAE) No. 3402, Assurance Reports on Controls at a Service Organization, was issued in December 2009 by the International Auditing and Assurance Standards Board (IAASB), which is part of the International Federation of Accountants (IFAC). ISAE 3402 was developed to provide an international assurance standard for allowing public accountants to issue a report for use by user organizations and their auditors (user auditors) on the controls at a service organization that are likely to impact or be a part of the user organizations system of internal control over financial reporting. UK Data Protection Act UK The British Data Protection Act controls how personal information is used by organisations, businesses or the government. Daily - Automatic scan one time each day, finds changes to gateway and policy configurations made with CLI or scripts. You can also run a manual scan, as necessary. 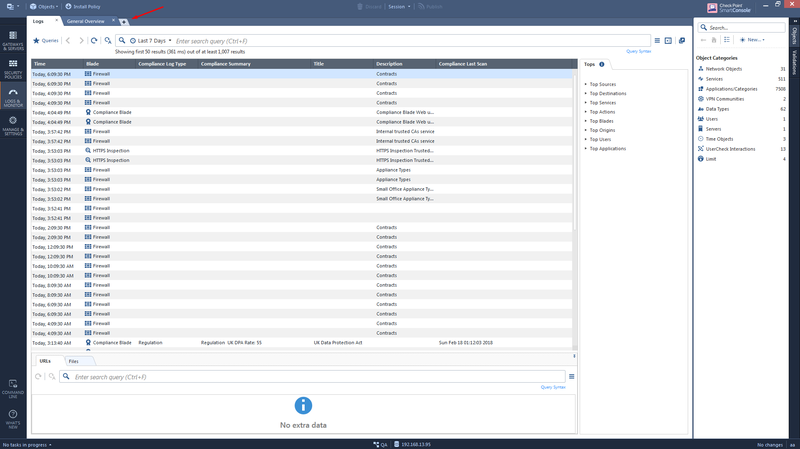 If administrator actions cause a degradation of the compliance status, the Check Point Compliance Blade displays an alert with details of the issue. It also generates an action item to monitor corrective steps. View - Use the Check Point Compliance Blade tools to examine and monitor compliance status. Plan - Manage Check Point Compliance Blade automatically generated Action Items. Act - Correct compliance issues as recommended by the Action Items. 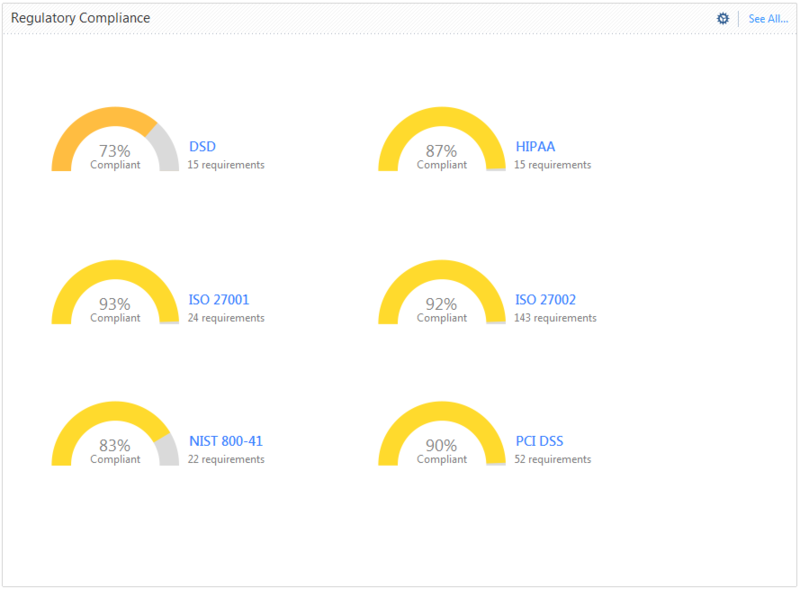 You can see the updated compliance status when you run Check Point Compliance Blade scans. Check Point Compliance Blade is supported starting in R77 GA.
For R75.40 and R75.45 versions, a special hotfix can be offered. See Check Point Compliance Blade R75.40 and R75.45 Release Notes. You cannot upgrade to higher versions when this hotfix is installed. If you do this, the Check Point Compliance Blade is not available. 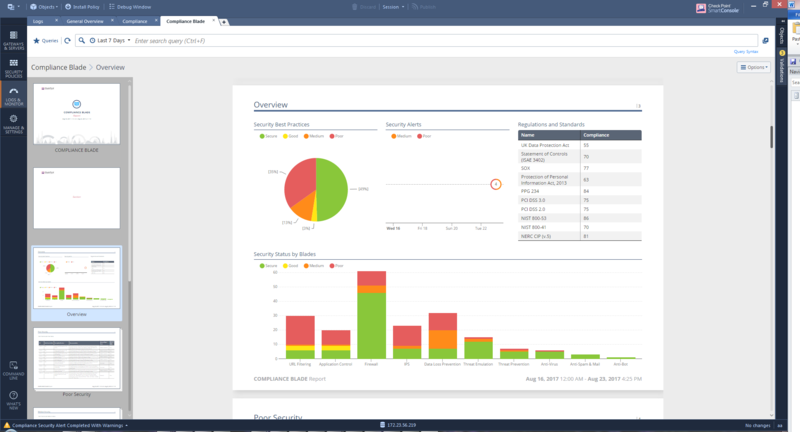 Connect with SmartConsole to Security Management Server / Domain Management Server and go to 'LOGS & MONITOR section > Add new tab > Open Compliance View'. 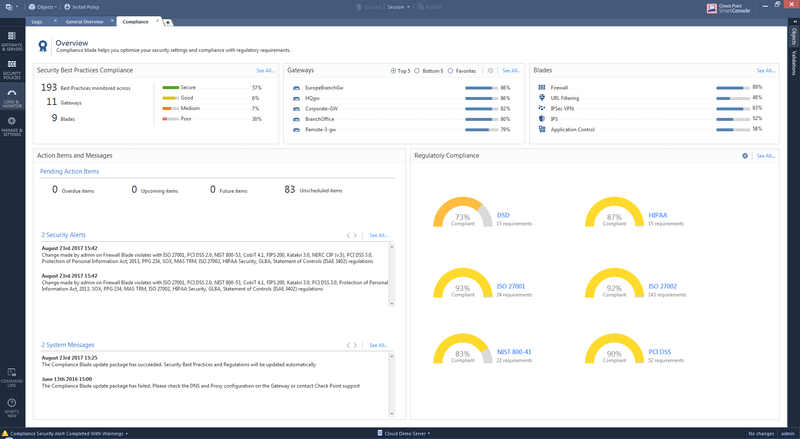 The 'Overview' pane shows the overall compliance status of your organization. Security Best Practices Compliance Displays compliance status information for each Best Practice. To see Best Practices recommendations filtered by status, click a status. To see all Best Practices, click on 'See All...'. Gateways Displays Security Status by Gateway - Security Gateways with the highest compliance scores, lowest compliance scores, or a predefined set of Favorites. To see the results for a specific Security Gateway, click on its name. Blades Displays Security Status by Blade - the average scores for the five Software Blades with the most Security Best Practices. To see the results for a specific Software Blade, click on that blade. To see the results for all Software Blades, click on 'See All...'. The number of regulatory standards shown is dependent on your screen resolution. Upcoming items - Action items with due dates in the next 30 days. Future items - Action items with due dates of more than 30 days. Unscheduled items - Action items without defined due dates. Overdue items - Action items that are overdue. This widget displays compliance status information for each Best Practice. Gateways, Software Blades, and regulations. The applicable Software Blade is not installed on the Security Management Server. The Security Gateway does not support the examined feature. Many Best Practice tests are boolean: either compliant, or not. Other Best Practice tests calculate a score based on the degree of compliance. Active - Select to activate the Best Practice test. Clear to deactivate it. Blade - Blade related to this Best Practice. ID - Check Point Compliance Blade ID assigned to the Best Practice. Name - Name and brief description of the regulatory requirement. Status - Poor, Medium, Good, Secure, or N/A. We recommend that you resolve "Poor" status items immediately. Description - What the selected Best Practice test looks for. Action Item - Steps required to become complaint, which also includes alternative scenarios. Dependency - Shows when the selected Best Practice is dependent on a different Best Practice. The selected Best Practice test is not performed unless the other Best Practice test is compliant. Relevant Regulatory Requirements - Link to show list of all regulatory standards that include the Best Practice test that generated the selected action item. 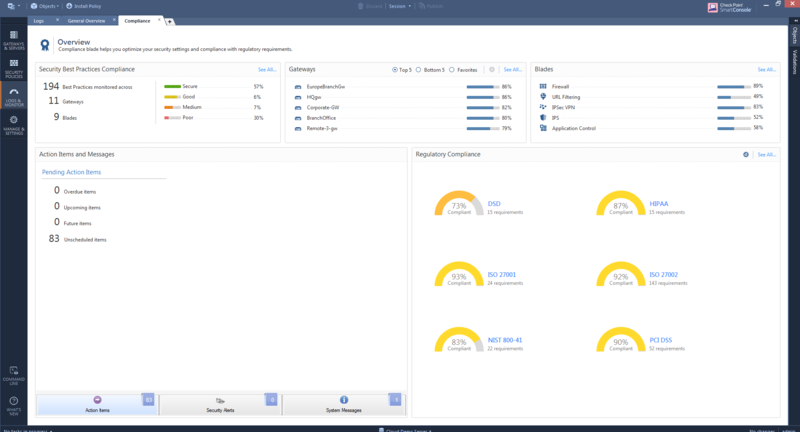 This widget displays Security Status by Gateway - the five Security Gateways with the highest compliance scores, lowest compliance scores, or a predefined set of Favorites. To see the Best Practice test results for a specific Security Gateway, click on its name. To see the results for all gateways, click on "See All Gateways". Click on a Security Gateway / Cluster object in this window to see the details. Name - Best Practice test name and brief description. This widget displays Security Status by Blade - the average scores for the five Software Blades with the most Security Best Practices. To see the results for a specific Blade, click on that blade. Description - Detailed description of the Best Practice test. Click the configuration icon in the top right corner of the pane. 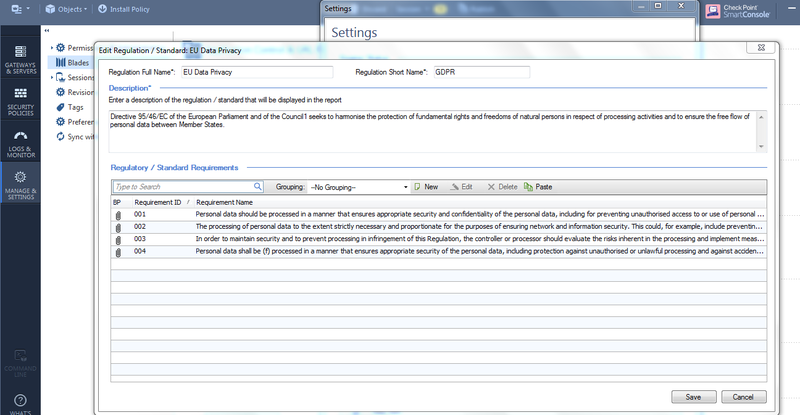 In the Select Regulations and Standards window, select the standards to show in the Overview. ". The All Regulatory Requirements window opens. To see details of a standard, click the name of the standard in the Overview pane or in the All Regulatory Requirements window. The Regulatory Requirements pane for the selected standard opens. Check Point Compliance Blade ID. Status (Poor, Medium, Good, Secure, or N/A). Name of the regulation, taken from the published standard. Description - What the standard requires. Relevant Best Practices - Best Practice tests for the selected requirement, and their compliance status. Overdue items- Action items that are overdue. Note: It is a best practice to resolve overdue action items immediately. If you have a high resolution, then the Alert and System messages show in the bottom section of the pane. Use the arrows to scroll through the messages. If you have a low resolution, then two buttons show in the bottom section of the pane. To see alert messages, click "Compliance Alerts". They open in the 'Overview' pane. 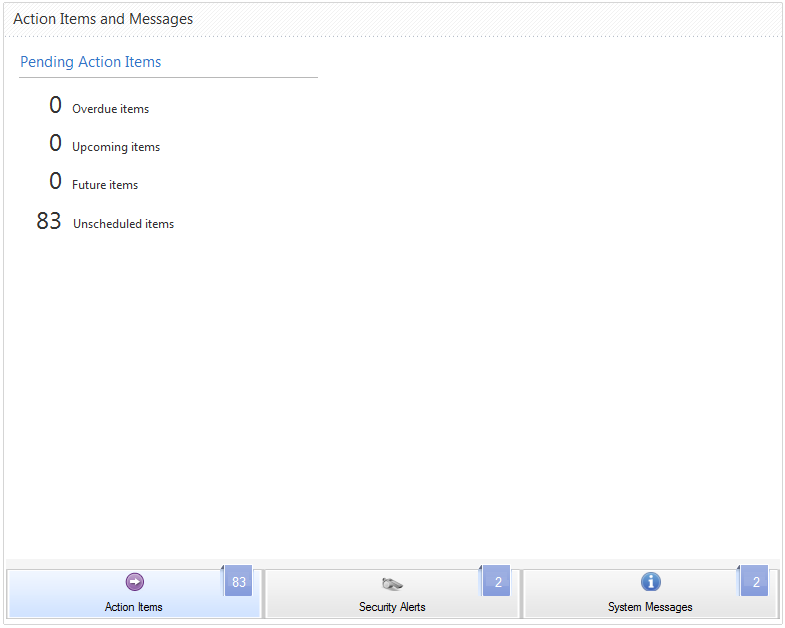 To see messages about the Check Point Compliance Blade, click "System Messages". They open in the 'Overview' pane. To open the action items for a status category, click that category. The 'Action Items' pane opens. Due Date - Optionally assigned due date for resolving this Action Item. 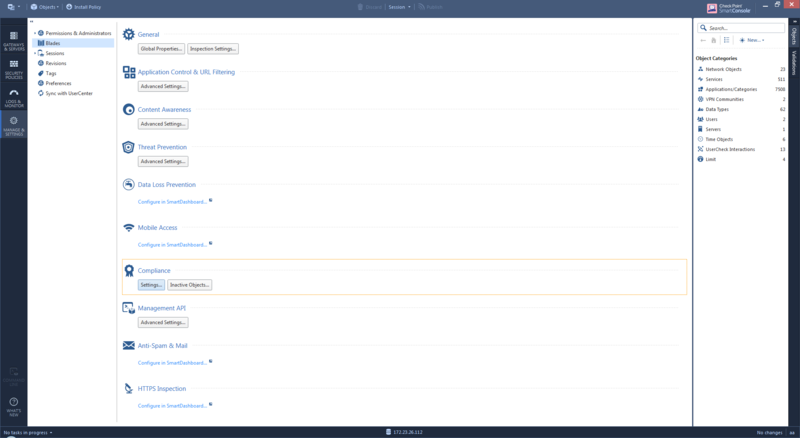 A due Date is not automatically assigned when an Action Item is generated. Action Item Description - Steps required to become complaint, which includes alternative scenarios. Due Date - Optionally assigned due date for resolving this Action Item. You can assign or change a due date here (see "Working with Action Items"). You can define your own, custom Security Best Practices based on organizational security requirements. This release supports user-defined Security Best Practices. 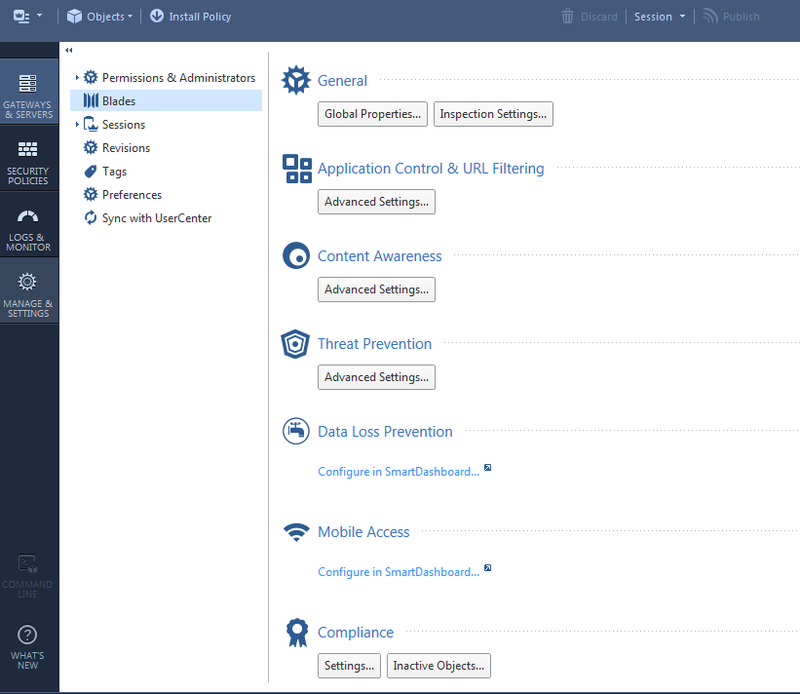 You define user-defined Security Best Practices in the SmartConsole Compliance tab. In the 'Compliance tab > Security Best Practices pane', click "New". Name and Description for this Best Practice. Name and Description for the non-compliance Action Item generated by this best practice. Note: In this version, you cannot change the Relevant Blade option. It is automatically set to Firewall. In the "Best Practice Rule Definition" table, enter rule matching criteria in the table cells. Each cell matches one related field or parameter in Security Policy rules. A Security Best Practice match occurs when all table cells match one or more rules in the Rule Base (Logical AND). Hit Count - Select a Hit Count level. A match occurs when the Hit Count for a rule is equal to or exceeds the specified Hit Count level. Any - Matches all rules (default). Blank - Matches all rules that do not have a name (null value). Not blank - Matches all rules that have a name. Exact - Enter a text string. A match occurs when the rule name is the same as the specified string. Starts with - Enter a text string. A match occurs when the rule name starts with the specified string (case sensitive). Ends with - Enter a text string. A match occurs when the rule name ends with the specified string (case sensitive). Contains - Enter one or more text strings. A match occurs when a rule name contains the specified strings in the order you enter them (case sensitive). Source - Select one or more source objects. A match occurs when at least one of the specified objects are included in the Source field of a rule. Destination - Select one or more destination objects. A match occurs at least one more of the specified objects are included in the Destination field of the rule. VPN - Select one or more VPN communities. A match occurs when at least one of the specified VPN communities are included in a rule. Service - Select on or more services. A match occurs when at least one of the specified services are included in a rule. Action - Select one or more actions. A match occurs when at least one of the specified actions are included in a rule. Track - Select one or more tracking options. A match occurs when at least one of the specified tracking options are included in a rule. 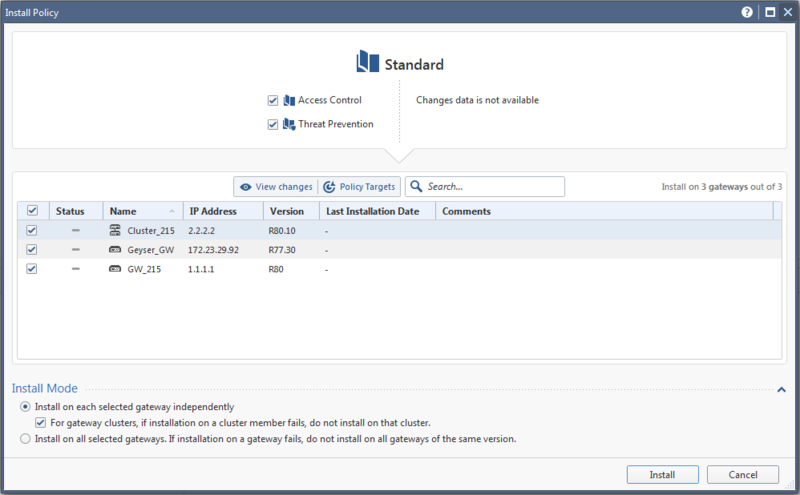 Install on - Select one or more Gateway, Cluster, or group objects. A match occurs when at least one of the specified objects are included the "Install on" field of a rule. Time - Select a time option that defines when the system enforces a rule. A match occurs when at least one specified time option is included in a rule. Blank - Matches all rules that do not contain text in the Comment field (null value). Not Blank - Matches all rules that contain text in the Comment field. Starts with - Enter a text string. A match occurs when the Comment field in a rule starts with the specified string (case sensitive). Ends with - Enter a text string. A match occurs when the Comment field in a rule ends with the specified string (case sensitive). Negate Cell - Right-click a cell to match all objects except the specified objects. This feature is not available for the Name and Comment cells. Note: If you use the Negate Cell option on a cell that contains the Any object, no match can occur. This is the same as a blank cell. Percentage - The percentage of the Rule Base to scan. For example, select Bottom 30% to scan 30% of the Rule Base starting from the bottom (last rule in the Rule Base). Last Hit Date greater than - Select to include only rules that have at least one hit on, or after the specified time period. Select the number of time periods and the type of period. For example, select 2 Months to include only rules that have at least one hit during the last two months. Define how Compliance Blade creates a violation (Action Item) when a Security Best Practice matches a rule. Rule found - A violation can occur when a rule matches the Security Best Practice (Default). Rule not found - A violation can occur when no rules match the Security Best Practice. Tolerance - A violation occurs when there are more than the specified number of matches (Default = 0). For example, if the tolerance is set to 0, the Compliance Blade creates a violation when the first match occurs. If the tolerance is set to 3, the Compliance Blade creates a violation when the fourth match occurs. Note: The tolerance option applies only to the Rule found option. Define when the Rule Index (Rule number) shows in the Relevant Objects pane. You can configure custom Security Best Practices to show the Rule in specified circumstances. This lets you easily see which rules cause or prevent violations. Display rules that match - Shows Rules that match the specified criteria in a Security Best Practice. Display rules that don't match - Shows Rules that do not match the specified criteria in a Security Best Practice. Don't display rules - Does not show the Rule. To see the status of your Security Best Practice, click "Preview". This feature runs the new Security Best Practice and shows the results in a window. 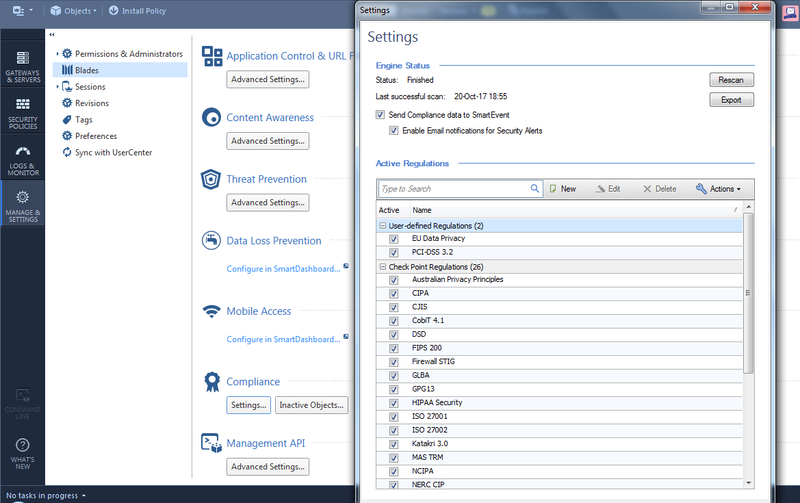 In the 'Compliance tab > Security Best Practices pane', double-click a user-defined Security Best Practice. In the Best Practice Definition window, change the parameters and settings as shown in the above procedure. If the user is accessing Compliance Blade for the first time, then Navigate to 'LOGS & MONITOR' and click "Open Compliance View". Click "+" to open New Best Practice dialog. If the user is not accessing Compliance Blade for the first time, then navigate to 'LOGS & MONITOR > Compliance > Security Best Practices' and click "New". 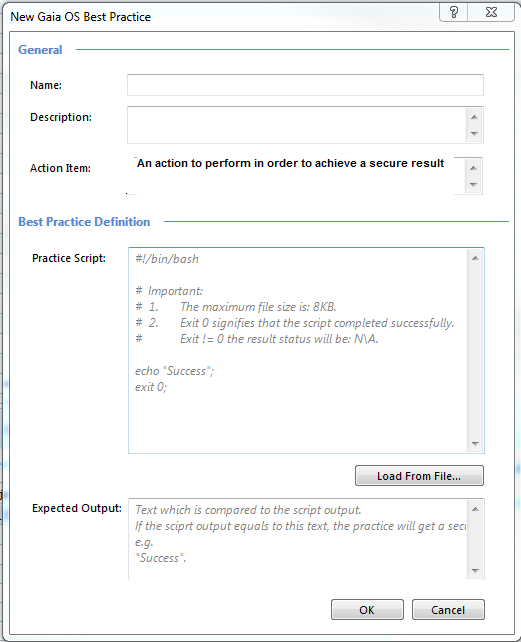 Enter Best Practice Name, Description, Action Item, Practice Script, Expected Output and click "OK". Your new Gaia Best Practice will be added to the list of Best Practices. Navigate to 'MANAGE & SETTINGS'. Navigate to 'LOGS & MONITOR > Compliance'. The scan resuls for the new Gaia OS Best Practice are displayed. 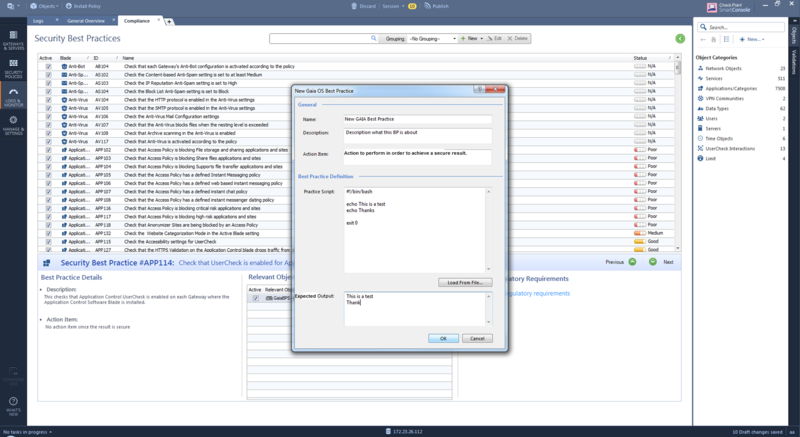 In the Check Point Compliance Blade panes, enter a string in the search field to filter results. To group results, select "Blade" or "Status" in the grouping field. To sort the results by values in field, click that field header. You use the Alerts and System Message pane to see alerts generated when a configuration change causes compliance status degradation. You can also see messages that are automatically generated by the Check Point Compliance Blade. To see the details of a system message, double-click it. The Alert Details window opens. You can activate or deactivate Best Practice enforcement of tests by test (for the organization), by gateway, by Software Blade or by other objects. Activation changes are applied after the next scan. By default, all Best Practice tests are active. Select a Best Practice test in the top section, or in the Related Objects section. 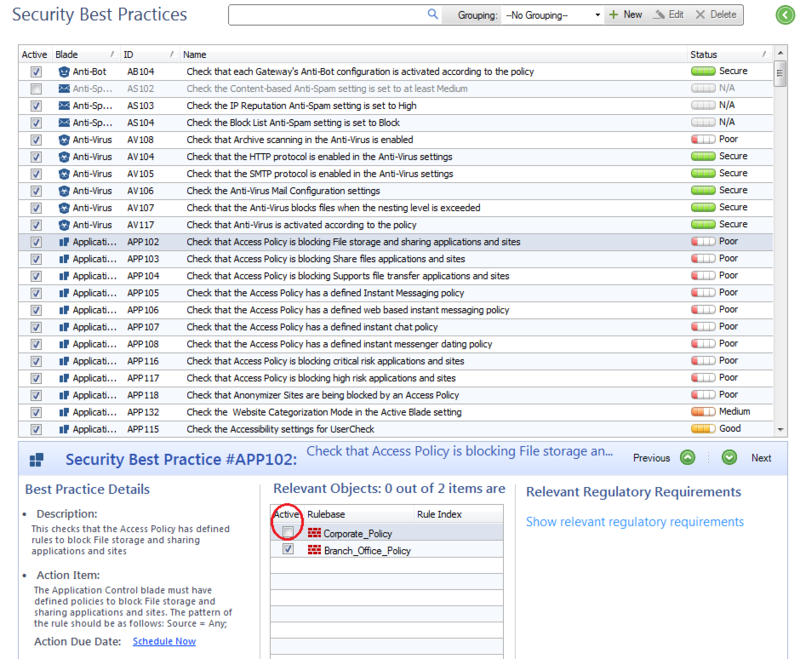 In 'Compliance' tab > 'Security Best Practices Compliance' overview, clear the "Active" option for the Best Practice test. When prompted, enter an explanation. A comment is required to show why it is necessary to stop running this compliance test. Optional: Define an expiration date. If you define an expiration date, the deactivated test is automatically activated on that date. Navigate to 'MANAGE & SETTINGS' > 'Blades' > 'Compliance' > Open 'Inactive Objects...'. De-activated Best Practice tests are shown in the Inactive Security Best Practices section. Select a Best Practice in the list. Double-click a Best Practice test in the Inactive Objects pane. Navigate to 'MANAGE & SETTINGS' > 'Blades' > 'Compliance' > Open 'Inactive Objects...'. In the Inactive Gateways section, click the "Add" icon. Enter or select a gateway or cluster. The selected gateways show in the Inactive Gateways list. Click the "Remove" (X Remove) icon. 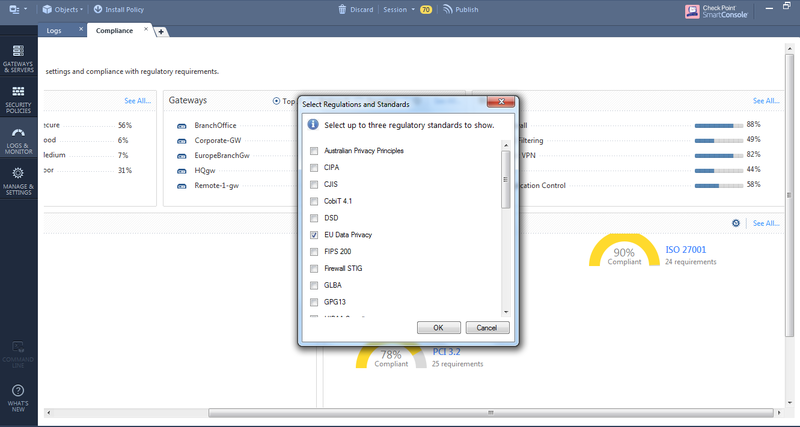 In 'Compliance' tab > 'Security Best Practices Compliance' overview, select the Best Practice test. In the Relevant Objects section, clear the "Active" option for the object. An object can be a gateway, policy, profile or other object. '. The de-activated Best Practice test is in the "Inactive Security Best Practices on Specific Objects" section. Select the Best Practice test. You add objects to your Check Point environment. You activate or de-activate a Best Practice test. Navigate to 'MANAGE & SETTINGS' > 'Blades'. On the Settings page, click "Rescan". Note: While a scan is running, you cannot work with the Compliance tab. Regulatory Requirements shows the Check Point Compliance Blade Best Practice tests that examine compliance with the requirements of standards and regulations. Navigate to 'LOGS & MONITOR'. 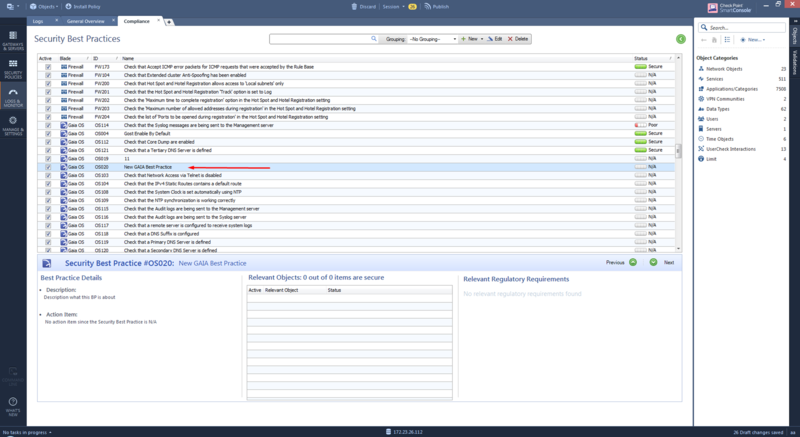 Go to the Compliance tab and open in Regulatory Compliance pane 'See All' link. Click a regulatory standard. The selected regulatory standard pane opens. You can select the regulatory standards that are applicable to your organization. By default, all supported regulatory standards are active. Select the regulatory standards that are applicable for your organization. Clear the regulatory standards that are not applicable for your organization. Have an XML file saved locally. In order to import a new regulation or standard, you must have it saved locally as an XML file. 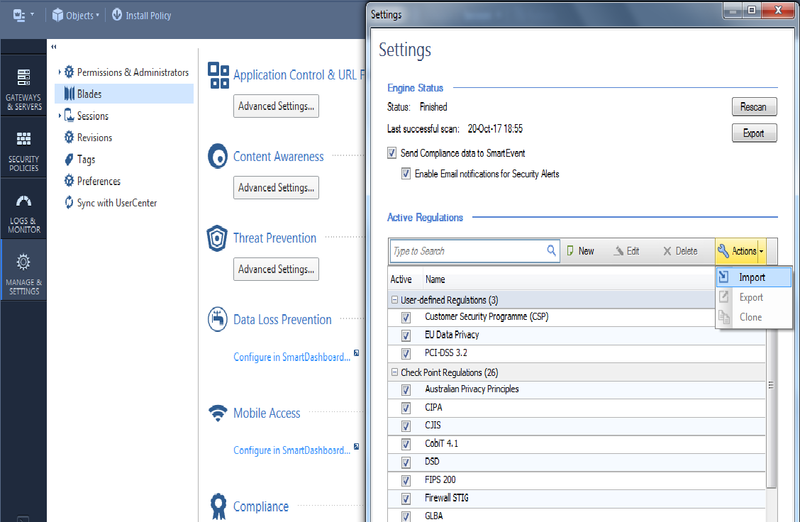 Open up the Compliance Settings in the SmartConsole. In the Navigation Toolbar, click on 'Manage & Settings > Blades > Compliance' and click on the "Settings" button. Import the Regulation XML file. Go to the Actions drop-down list and select "Import". Select the XML file you want to import. Once selected, import the file. The regulation will now appear in your list of User-defined Regulations. Save the Regulation. Open the regulation by double-clicking on it. Press save and wait for the process to complete. This could take three to four minutes. 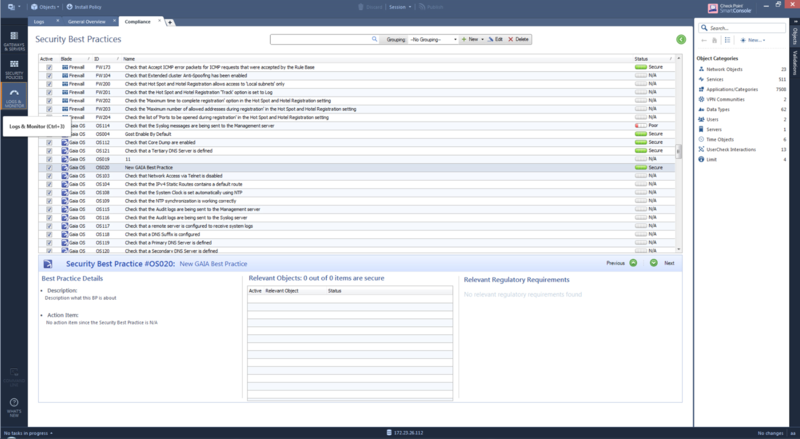 Display the imported Regulation on your Compliance Dashboard. 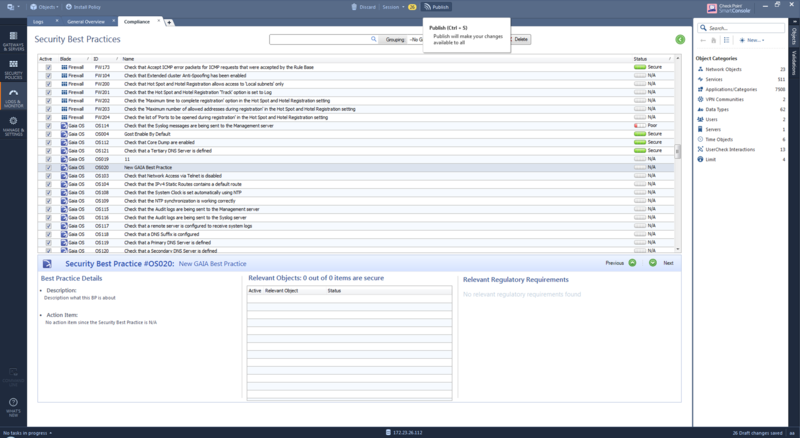 Once the Regulation is imported, you can now add and manage it from your Compliance Dashboard. In the Navigation Toolbar, click "Logs & Monitor" and open the Compliance Tab, or click on the configuration icon in the top right-hand corner of the pane, or select the Regulation you just imported and click "OK" to save. IMPORTANT NOTE: Remember that to save any SmartConsole changes, you must Publish those changes. 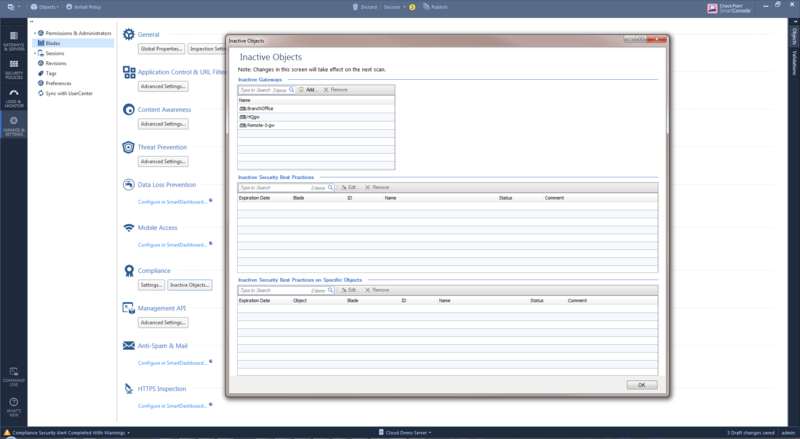 When a Best Practice test finds a deficiency, the Check Point Compliance Blade automatically generates an Action Item. You can assign a due date to an Action Item and monitor corrective steps. Action Items are not assigned a due date when they are generated. When you complete the corrective steps, the Check Point Compliance Blade deletes the Action Item after the next scan. Go to the Compliance tab > 'Action Items and Messages' > 'Pending Action Items' > 'Unscheduled items'. In the Action Item Description section, click "Schedule Now". If the Action Item already has an assigned due date, click on the date link to change it. In the window that opens, enter or select a due date and then click "OK". Deactivate the applicable Best Practice test (see "Deactivating Tests"). Run a manual scan: 'Settings' > 'Rescan'. The Check Point Compliance Blade has features that help you to quickly implement corrective steps in SmartConsole. 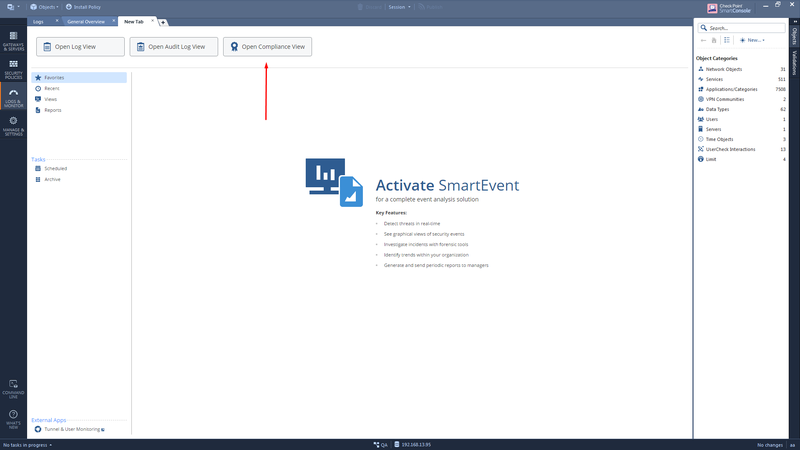 The Action Items pane shows a helpful description for each Action Item, which gives suggestions to correct the related configuration. You can also correct some issues with the command line. You can correct issues by using the description to guide you through the configuration steps. Generate reports for status summary and details of Best Practice tests and Action Items. To generate a report, navigate to 'LOGS & MONITORS' > new tab > select "Reports" and then select 'Compliance Blade' report. The report shows in a pane with the report name as the title. Per Regulation - Shows a summary of the regulatory requirements and a detailed list of the Best Practice tests included in each requirement. To generate a report, navigate to 'LOGS & MONITORS' > Compliance > click on specific regulation > click on: "Generate Report". The report shows in a pane with the report name as the title. You can export the data shown in the selected pane to a Microsoft Excel® file. 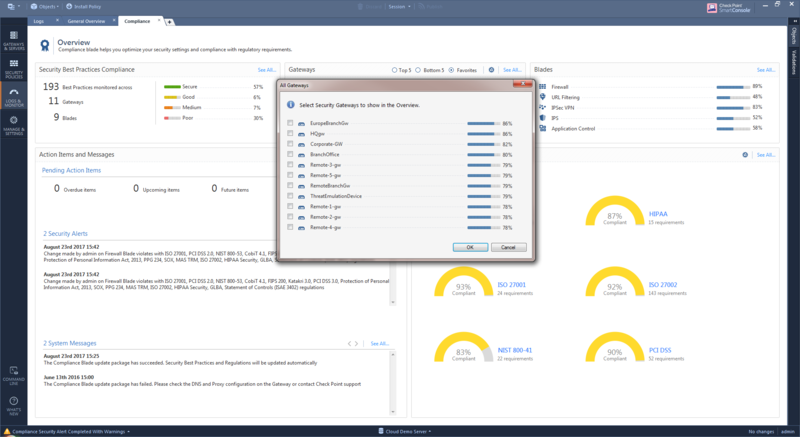 This lets you save the results for archiving, auditing, and analysis of historical trends and data relationships. Open a Check Point Compliance Blade pane. Go to main page of all reports. 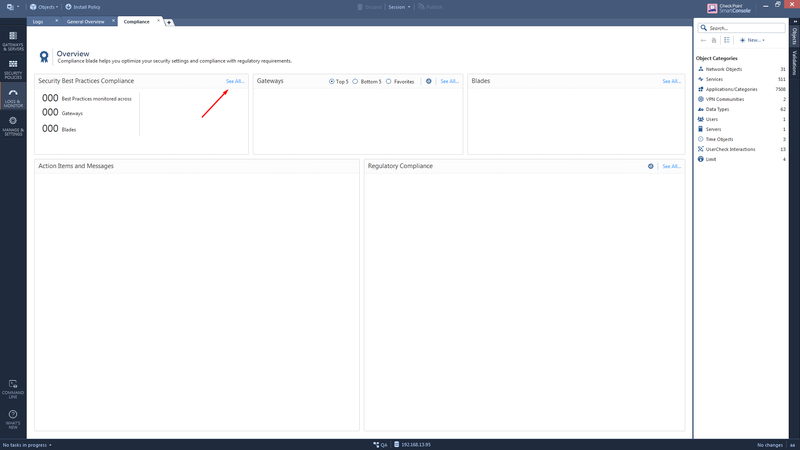 Symptom: In SmartConsole, in the Compliance Blade tab, you see "The compliance blade is not activated" message, and you cannot navigate in the tab's pages, or in 'LOGS & MONITORS' when you open new tab, the "Open Compliance View" is not displayed. 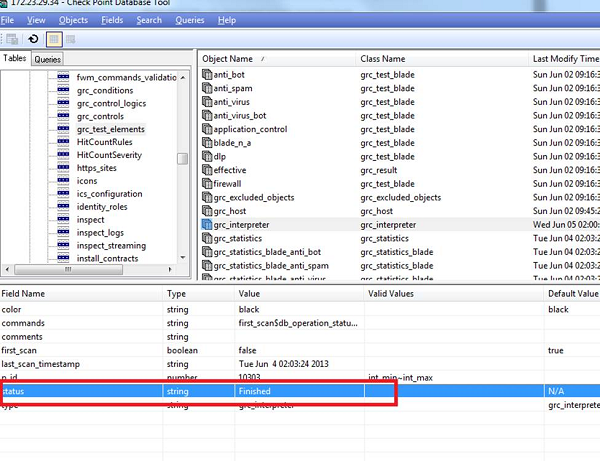 In SmartConsole, check the Security Management Server object. Verify that the "Compliance Blade" box is checked in the Management Blades section. 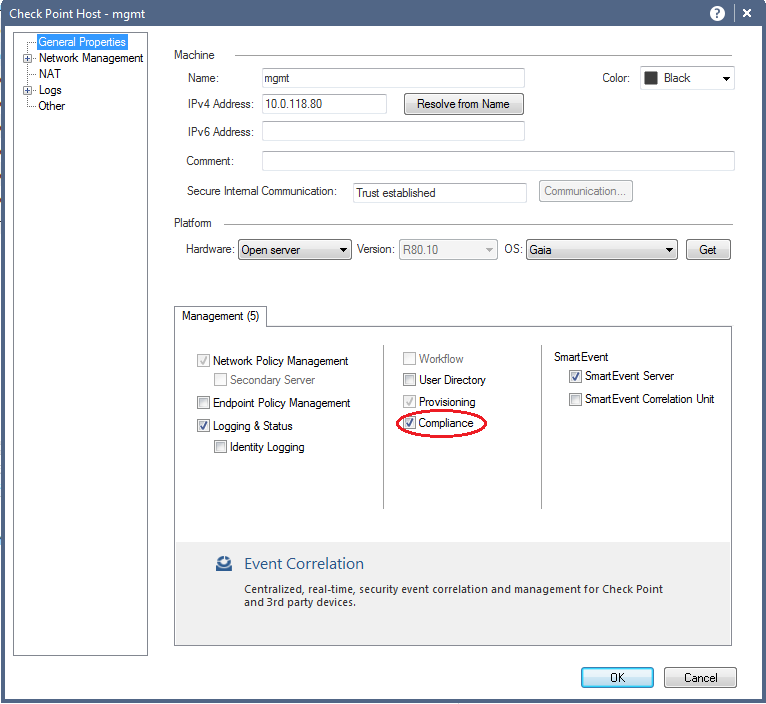 Symptom: If the Security Management Server IP Address that the customer used to login to the SmartConsole is not identical to the IP Address set on the Management object, there will be problems with connectivity to the Security Management Server. If that is the case, then the customer may still be able to login and access the Compliance tab, but he will get "The compliance blade is not activated" message. If no license is installed, the user will probably encounter this error message for the first time, when user will try to access the Compliance Blade tab in SmartConsole. Customer must purchase a Compliance Blade license according to the number of (supported*) gateway objects. If you have 3 gateways, you must buy a 5 gateway license. If you have 10 gateways, you must buy a 25 gateway license. If you have bought a 5 gateway license, but you have 6 (or more) gateways, the license will not work. If you have bought a 5 gateway license, and you have 5 gateways, but you later add an additional gateway object, after the next scan, the license will cease to work. *Supported Objects: The Compliance Blade currently only supports regular Gateways and Clusters. This means that currently all other objects will not be taken into consideration when counting the licenses. If a customer has a single Management, with 50 gateways, but only 5 are regular gateways, and the other 45 are Edge gateways, the customer can legitimately attach a 5 gateway license and it will work (because Check Point currently only counts "supported" objects). For a gateway cluster network object with two gateway cluster members, the compliance blade license count would be for two gateways. A license must be installed on each Management (assuming the customer wants to install the Compliance Blade on each Management). If the customer has Management A with 5 gateways, and Management B with 20 gateways, he needs to buy a 5 gateway license for Management A, and a gateway license for Management B that is equal or greater than the numbers of gateways attached to the Management. He cannot buy a 25 gateway license and split it between his two Managements. All other comments are the same as for Single Management, above. Whatever license is installed on the Multi-Domain Management container, is pushed down to all the connected CMAs. If there is a Multi-Domain Management, with CMA X, CMA Y, and CMA Z, and the customer installs a 5 gateway license on the Multi-Domain Management, a 5 gateway license is pushed down to CMA X, Y and Z. Likewise, if he installs a 25 gateway license on the Multi-Domain Management, a 25 gateway license is pushed down to all connected CMAs. If there are 10 supported gateways on the CMA, and the customer received a 5 gateway license from its linked Multi-Domain Management, the license will not work on this CMA. If a customer has a Multi-Domain Management with 20 CMAs. 19 of the CMAs have 3 gateways each, and 1 CMA has 20 gateways. If he installs a 5 gateway license on the Multi-Domain Management, the license is pushed to all 20 CMAs, but only 19 of them will work. If he installs a 25 gateway license on the Multi-Domain Management, all the CMAs will work. The initial full scan begins about 2-3 minutes after the first installation. You will get a notification in the Compliance Blade regarding the need to wait for the full scan to finish. A full scan can take between 2 - 5 minutes. During this time, the SmartConsole should work as usual. The Compliance tab will not display any information until the scan is finished. Once the Full scan is finished, the user can access the information in the blade and he should not see a "Full scan is in progress" message in the top of the Overview. Supported resolutions: Check Point supports 2 different thresholds of resolution: 1366x768 (laptop) and above. There is a slight difference in the Overview page. 1366x768 - "Action Items and Messages" widget displays the actual records. Activate by using 3 buttons. Above 1366x768 - Action Items and Messages" widget displays all the data with no buttons. The data regarding the "Compliance Alerts & Messages" is a preview (contains short descriptions) and for the full details you need to access the menu items by the link. Security Best Practice: if the customer has certain constraints that prevent him from configuring a Check Point Software Blade according to the recommendation, we enable to exclude individual Security Best Practices, by unchecking the "Active" field, along with the reason why it should be excluded and for which period of time. What happens behind the scenes when we "deactivate" a Security Best Practice? Changes will take effect only after a "save" and full scan (either nightly, or manually executed by the user via the Settings screen). These effects are: the Action Item regarding this Best Practice disappears, statistics in the Overview should change accordingly, compliance of Regulations should change, as well. How is the overall score recalculated? Each Security Best Practice gets a grade (percentage) and is given a status according to the thresholds. If the Security Best Practice is a Gateways / Profiles Best Practice, the grade is calculated as an average of the grades of each of its corresponding objects. Each Security Best Practice is assigned to one or more regulatory requirements. When is it recalculated? Next full scan. Expiration date for deactivation: Expiration date for deactivation can be set. The status of the Security Best Practice or object in Security Best Practice is not relevant in the calculation until the expiration date has passed. Again, the full scan will check the expiration dates and take this into account for the calculations. After excluding a gateway, do we need to actively perform a scan or is it automatic? You need to perform a scan. The gateways status is calculated as the average of all the Security Best Practices running on this gateway. Meaning, Global Properties Security Best Practices are not included in the calculation. Security Best Practices that have been deactivated on a certain gateway are not included in the calculation, as well. Status of a requirement: Each Security Best Practice is assigned to one or more regulatory requirements. The status of a requirement is calculated as the average score of all the Security Best Practices assigned to this requirement. The score is a percentage and translated into a status according to the same thresholds logic. How is the Regulation score impacted after a Security Best Practice is excluded? When does it change? After a Security Best Practice is deactivated (and full scan performed), the grade of the Regulation should be based on only the activated assigned Security Best Practices. After excluding a gateway, do we need to actively perform a scan or is it automatic? After deactivating a gateway, a "save" and full scan is needed in order to recalculate all the Security Best Practice results. After this is done, the Regulation results will change, as well. Are any processes being generated in the background? No processes are being generated. The system waits for the full scan. When setting a date, is there a process being run in the background? No process is being run. The only effect of the due date is the distribution of the statistics in the 'Overview' > 'Action Item'. Date format errors: where is the date format taken from? The dates/time is checked and compared with the server time. How do the Action Items interact with the daily scan? Once a Security Best Practice becomes 100% secure, its corresponding Action Item should disappear from the Action Items screen (in the menu). And the mini-scan? Once a Security Best Practice becomes 100% secure, its corresponding Action Item should disappear from the Action Items screen. When pressing Save, a mini-scan takes place. What is the process? How long should it take? What is normal and what is abnormal (in terms of time range)? A mini-scan recalculates the relevant Security Best Practice (relevant to the objects changed in the last save). This process should take up to 30 seconds. At the end of the process, the user is notified if any Security Best Practice statuses have gotten worse with Security alerts. Some actions will require a full scan (no mini scan will be executed after the save): Adding/removing gateway objects, adding/removing blades from gateways, deactivating Security Best Practice or Security Best Practice objects, IP Address changes in Profiles or Protections. When is "post-save" information updated in the Overview and Security Best Practice windows? After the mini-scan is finished (or full scan, as well), the GUI and data is updated automatically. Generation of Compliance Alerts - process involved? Part of the mini scan (see above). How the Save adds and removes Action Items based on the results? See "Action Items". How is the data generated? Based on the results in the last scan (what is viewed in the system at that moment). Format issues? - No export to Word. Permissions issue may cause the generation of the report to fail. Export to PDF issues? Some paging issues still exist. Export to email client? No issues. What happens when I export data to Excel? Process involved? The Excel Export is based on the results in the last scan (what is viewed in the system at that moment). Process when I select / choose my favorites? The favorite gateways are saved on the local machine. Each user has his own favorites. When editing a comment / timeframe of an Exclusion, is there a process in the background that updates somewhere? Requires a full scan to take effect. How does the software know when to cancel the exclusion (reached the due date)? Requires a full scan to take effect. Deleting an Exclusion - Requires a full scan to take effect. See "Exclusions - Deactivating a Best Practice, or object within a Best Practice". When performing Install Policy, are there any GRC processes running that impact performance? No process is running. Cancelling the Security Alerts post-install policy: What is the process here? Upon install policy, the user can decide to view the compliance report/view current Security alerts / delete the current Security alerts. If delete Security alerts is chosen, the alerts are deleted from the DB. No special process. If the help text is not loading, what is it being linked to? Standard SmartConsole help. Not specific to Compliance Blade. Scoring errors Should not be any. 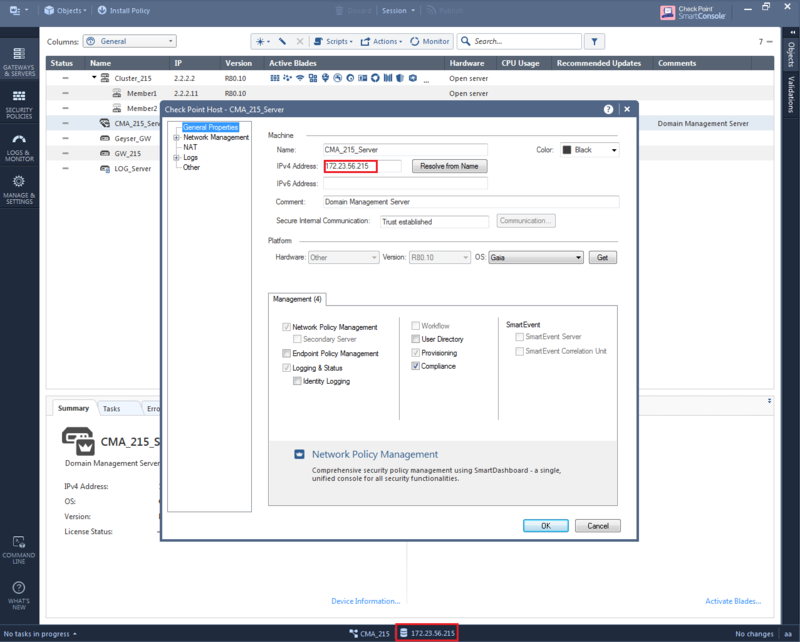 When a Best Practice is displayed as "NA"
The security product is not enabled on the specific gateway. Security Best Practices of type "OS" (Operating System) can only run on Check Point devices running the GAIA operating system, except for 61k and 64k appliances. For example, SMB devices run the GAIA Embedded operating system and therefore all OS best practices show N/A for each SMB gateway. Dependent Best Practice: A Security Best Practice can be dependent on another Security Best Practice status. The current Security Best Practice will be tested only if the dependent Security Best Practice is above a specified threshold. If it is not above that threshold, the current Security Best Practice will be "NA".
' > 'Rescan'), the status changes to "pending ..." and rescan does not start after more than 20 seconds. Go to 'Other' -> 'grc_test_elements'. Sort the table by the object name. Look for an object named "grc_interpreter" (there should be only one) and click on it. Look for the field_name "status". Right-click on that field and click "Reset". On the Security Management Server, run cpstop command. Edit the file /opt/CPPIgrc-R75.4X/bin/grc.conf: Set the value of debugMode to "1"
Note: Starting from R77, edit the file $FWDIR/conf/grc.conf. Connect with SmartConsole to Security Management Server / Domain Management Server. 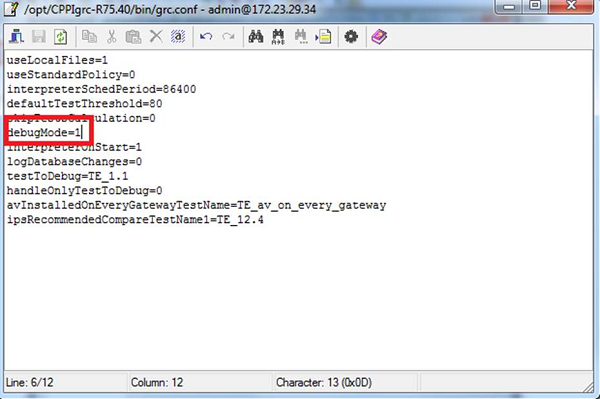 Note: Starting from R77, $FWDIR/log/grc_interpreter.elg*. In the $FWDIR/log/fwm.elg file, look for the string: "interpreter was requested to rerun". If you find the string, we should look for additional information about the cause of the problem in the continuation of the log. Otherwise/If instead you see "no pending requests found" - should coordinate with Contact Check Point Support. The Compliance blade supports VSX Gateways / VSX Clusters running R77.20 and above. By design, the "Security Best Practices" for "Gaia OS" are not checked on VSX Gateways / VSX Clusters. The relevant object for APP & URLF practices are the Policies, since you need to handle them per policy (and not layer). As for inline layers, the parent rule of inline layers are usually not Src = 'Any' Dst ='Any' or 'Internet'. Hence, even though the inline layer rule states Src = 'Any' Dst ='Any' or 'Internet' , the traffic that reaches the inline layer for matching may be skipped because of the parent definition. Related Solution: sk92861 - ATRG: Compliance Blade (Pre-R80.10).